Your access to and use of the Health 2000+ Ltd Website is subject to these Terms and Conditions. By accessing and using this Website, you accept and agree to these Terms and Conditions without any limitation or qualification. These Terms and Conditions together with your Order constitute the entire Contract between Health 2000+ Ltd and you for the supply of Products you have ordered. No other Terms and Conditions will apply. The Contract cannot be varied unless we agree to vary it in writing. 'Order' means the order submitted by you for Products on the Website and 'Products' means the products available for sale on the Website. By accepting these Terms and Conditions you acknowledge that you are over the age of eighteen (18) years. If you are under the age eighteen (18) years you cannot place orders with Health 2000+ Ltd. Should Health 2000+ Ltd suffer any damage or other losses as a result of a transaction entered into by a minor, Health 2000+ Ltd reserves the right to seek compensation for such losses from the parents or guardians of the minor who caused any order(s) to be placed with Health 2000+ Ltd. Transactions are processed via an industry standard secure https connection using DPS as a third party payment gateway. This means that you can be assured that your sensitive data such as credit card numbers will remain confidential because all information is 128 bit encrypted. Cards accepted are VISA, Mastercard, American Express (Amex) and VISA/MasterCard charge cards. We also accept payment via Direct Debit into our bank account. If you choose to this payment option, submit your order and you will be emails an invoice with our account details. All Health 2000+ Ltd purchases include GST unless otherwise stated on the Product listing. Information provided on our site is for information only. Weight Management programmes should be used in conjunction with a balanced diet. If you have a pre-existing medical condition, are pregnant or lactating, consult a health professional prior to use. Always read the label and take as directed. If symptoms persist consult your healthcare professional. 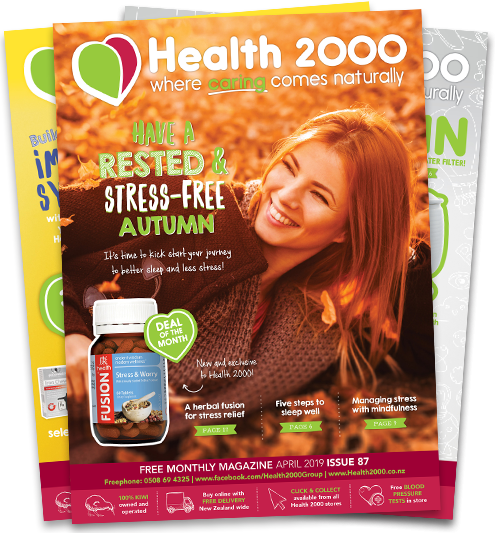 Health 2000+ Ltd makes every reasonable effort to present accurate information on this Website, however we accept from time to time the information may contain typographical errors or inaccuracies and may not be complete or current. We therefore reserve the right to correct any errors, inaccuracies or omissions and to change or update information at any time without prior notice (including after you have submitted your order). Please note that such errors, inaccuracies or omissions may relate to product description, pricing and availability. We also reserve the right to limit quantities (including after you have submitted your order). We apologise for any inconvenience this may cause you. If you are not fully satisfied with your purchase please see our returns policy for details on how to obtain a refund. Our website may contain links to other websites that are not owned, operated or controlled by Health 2000+ Ltd. We cannot be responsible for any content accessed via these other sites. Downloading material from some sites may risk infringing intellectual copyright or introduce viruses to your system. Please read the terms and conditions of these other sites. Please be aware that our website contains trademarks which can belong to either Health 2000+ Ltd or third party companies. Using the logos, icons and service names is prohibited in any manner and will be considered a violation of copyright law. Each Health 2000+ Ltd online voucher is personal to the user receiving it, is not transferable, has no monetary value and under no circumstances can it be converted into currency. Each voucher has an expiry date which cannot be modified. When using a Health 2000+ Ltd voucher online, the total value of the order (excluding delivery costs) must be higher than the value of the voucher. No credit can be retained on the voucher. Under no circumstances can the value of a discount Health 2000+ Ltd voucher be deducted from an order if that voucher is out of date: no replacement Health 2000+ Ltd voucher will be issued. We do not pre-screen messages, but may monitor content from time to time for the purpose of guarding against unlawful or inappropriate gift message; and we have the right to refuse to send messages and to terminate access to the gift message service at any time and without liability to you. Please note: H2000 vouchers purchased in-store cannot currently be used for online purchases at this time, however this service will be available in the near future. Phone toll free on 0508 MY HEALTH (0508 69 4325) or (07) 839 7768 between 8.30am-5.00pm Monday to Friday.